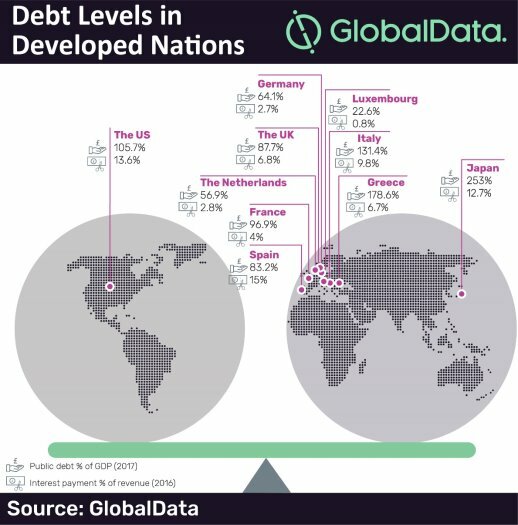 The sovereign debt levels of developed countries have risen to an alarming level in recent years, posing a serious threat to their economic prospects, says GlobalData, a leading data and analytics company. The debt to GDP ratio in developed nations in 2017 was 380% compared to over 200% in the developing nations according to data from the Institute of International Finance (IIF). The changing political landscape of the developed countries is adding to their debt burden. In the US, President Trump announced massive tax cuts in combination with an increase in federal spending and consequently the US government ended up issuing more bonds into the debt market. The substantial decrease in tax revenue is expected to cost the US treasury US$1.9 trillion over the next decade. According to the International Monetary Fund (IMF), the majority of developed nations with the exception of the US are forecast to actually reduce their debt levels over the next six years. However, in the US, the debt to GDP ratio is estimated to increase by 8.2% over the same period. The overall debt of the US grew at an average annual rate of 7.1% during 2010-2017 to reach a staggering US$20.5 trillion in 2017 (105.7% of GDP). Amongst European countries, the public debt levels in Italy and Greece were very high in 2017 at 131.4% and 178.6%, respectively. Italy accumulated a substantial amount of debt but managed to remain solvent by privatizing government organizations and cutting back on expenditure. However, the current Italian government’s anti-austerity measures have further aggravated the country’s debt burden since coming into power in 2014. Japan, the country with the highest public debt to GDP ratio in the world, pays a substantial amount in interest payments at 12.7% of the country’s total revenue. According to data from the World Bank, US interest payments as a percentage of total revenue rose from 11.2% in 2000 to 13.6% in 2016. Spain’s interest payments have also increased from 13.7% to 15% during the same period. In 2011, Greece paid 16.9% of its total revenue in interest payments which declined to 6.7% in 2016 following the introduction of stringent debt reduction strategies. The UK’s interest payments as a percentage of revenue reduced from 8.9% in 2011 to 6.8% in 2016 as the government’s austerity programme helped to reduce the budget deficit. The European Central Bank’s (ECB) expansionary monetary policy following a negative deposit rate and its extended asset purchasing program resulted in a drop in yields. This lowered Italy’s interest payments as a percentage of total revenue which declined from 11.9% in 2011 to 9.8% in 2016, thereby reducing its fiscal deficit. Clearly the cost of servicing mounting public debt is putting tremendous pressure on public finances around the world. This press release was written using data and information sourced from proprietary databases, primary and secondary research, and in-house analysis conducted by GlobalData’s team of industry experts. 4,000 of the world’s largest companies, including over 70% of FTSE 100 and 60% of Fortune 100 companies, make timelier and better business decisions thanks to GlobalData’s unique data, expert analysis and innovative solutions, all in one platform. GlobalData’s mission is to help our clients decode the future to be more successful and innovative across a range of industries, including the healthcare, consumer, retail, financial, technology and professional services sectors. As part of GlobalData macroeconomic offerings for cities, we provide comprehensive data on over 3,000 cities, including major metropolitan areas covering 150 countries. The database covers over 300 indicators for each city across five essential indicator themes – demographic, economic, employment, income, and expenditure data. Long-term historical data is sourced from a number of national statistical and international institutions, with forecasts provided by our team of highly experienced economists. PR2279.